Our periods can’t seem to catch a break these days. Not only have they long been stamped with a label of disgust, embarrassment and discomfort, to add to insult to natural-bodily-function, we also get taxed for them. And then recently, the charity Freedom4Girls revealed the shocking news that many girls from low-income families are regularly missing school during their period as they are unable to afford sanitary products. Step forward campaigner and student, Amika George, who three weeks ago started a campaign and petition with the potential to change the lives of thousands of young women for the better and proved that some fights can be bloody…but without harming a single soul. We were privileged to speak to Amika about her campaign’s aspirations and inspirations, and hope you will join us in supporting her campaign. I’m 17 and live in London. I’m studying for my A-Levels in Politics, History, French and Maths while campaigning. Please can you outline your campaign for us? The campaign is to help eradicate Period Poverty. 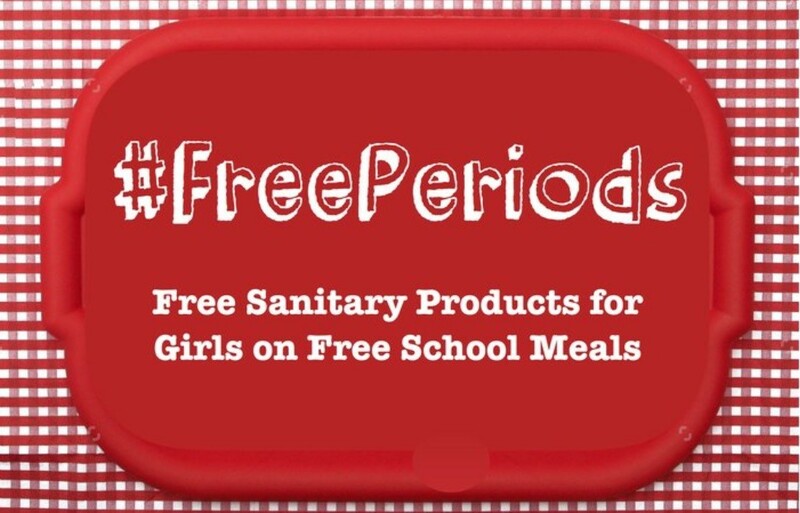 I’m calling on the government to give all girls on free school meals free sanitary products. I started this campaign after reading about girls from low-income families having to miss school, as they just couldn’t afford to buy sanitary products. Others were using makeshift alternatives such as socks and newspaper, or even rolls of toilet paper. This is happening to girls as young as 11 and it’s not right to sit back and do nothing. I’ve started an online petition to lobby the government to provide sanitary protection to those who are in the most need and I’m trying to raise awareness of period poverty as much as I can! I really believe that this is something that could actually happen soon. Why do you feel these issues are important? No girl should have to choose between her education and her period. Sanitary products aren’t a luxury and periods are certainly not a choice. If there is a lack of provision that’s preventing these girls getting the education they are entitled to, then it is absolutely unacceptable for the government not to address this. I can’t stress how important it is that these young girls are supported. As many girls are forced to miss school every month, they find themselves falling further and further behind in their education. This affects their ambition, academic attainment and self-worth. Giving them access to sanitary products would not only give them dignity, but would also enable them to break out of the cycle of poverty. If we help girls to continue their education, without the fear of having to miss school, they will be more likely to be able to provide their daughters with sanitary products, and they will be less likely to be living in similar environments, of poverty and deprivation. It would not be a huge expense for the government to implement and it could significantly improve these girls’ life opportunities, possibly for generations. Sadly, because talking about periods is still considered taboo, a little secret that all women carry with us, girls in period poverty often don’t tell a soul, and suffer alone. The more we talk about periods and period poverty, the more we will normalise something that affects half the population every month for most of their lives. Why should that be taboo? How can young people (or anyone) get involved in supporting this cause? First and foremost, by signing and sharing the petition! It takes less than 20 seconds – honestly! By signing, you are adding to the ever-growing list of people telling the government that this is wrong and that action is needed. That’s really important! Circulate the petition in your schools, colleges and amongst your friends and families. Send the petition link with #FreePeriods to everyone on Twitter – MPs, key influencers, campaigners, charities, newspapers, magazines. If people see the word, ‘periods’, everywhere, it becomes less of a word that everyone avoids! Write to your local MP asking for these girls to be helped. You can use /www.writetothem.com/ to find and contact your MP. Is there a message you would like to give to other young campaigners (or would-be campaigners)? It’s not easy to campaign, especially if you’re studying at the same time, but every one of us can do something to help change things we think are wrong. Even a small thing. I’m only three weeks into the campaign and I’ve had such an incredible response. When you’re fighting for something you feel passionately about, and other people get behind you, it’s clear that you’re not the only one that wants change. That’s so encouraging! People have written to me to ask how they can help and offered their support in different ways. And that’s just brilliant! Keep thinking of the people you’re standing up for and it will give you the courage to keep going! Do you have a role-model who inspires you, and if so, who? Laura Coryton who fought to abolish the tampon tax. She’s been incredible. A real support! She started her petition from her bedroom and, with thousands of fearless campaigners behind her, made history. And, she got MPs saying the word, ‘period’ in Parliament! That’s a real achievement! You can sign and follow the petition's progress on change.org here.